From directorial powerhouses Steven Spielberg & Peter Jackson with voices of some of Britain’s acting and comedy elite comes the Adventures of Tin Tin. Andy Serkis, Daniel Craig, Jamie Bell, Pegg & Frost and Mackenzie Crook have joined forces on this production and all add to the gravitas of these directors. Though you would be hard pressed to decipher which actor had been assigned to which character, which was refreshing and allowed the movie to be judged on its own merits. Thanks to the ever generous ladies at Mummypages.ie the Gorgebags & I got to head along to the Irish Premiere on Sunday. Thanks, folks! My real bugbear with 3D offerings of late is the colour and unfortunately those issues are present here. The vibrant colours are almost washed completely by wearing the glasses. Even with their addition for effect the backgrounds were blurred and unfocused, which made some shots a little distracting. I did notice several audience members forgo the glasses altogether. The character animation, however, is a triumph. The comic is brought to life with an engaging cast and constantly changing scenery. Captain Haddock is a stand out here and surprisingly witty, his mannerisms and personality adding to the comedy each time he’s on screen. Snowy the dog is given his due and developed as a character in his own right, I have to mention the Rottweiler scene too as the penman behind this obviously has one of those soppy brutes at home. (As do I). What could have been a scary scene was turned on its head and the delighted reaction of the audience showed they appreciated it. 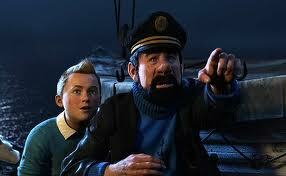 Tin Tin himself is likeable but is somewhat overshadowed by Captain Haddock. Although historically Tin Tin is more of an adult comic strip there was an abundance of under 10s in the audience. I did think the plot a little difficult for them to follow but the gales of laughter from the, often slapstick, humour proved me wrong. My own lads are 14 & 15 and didn’t take their eyes from the screen once, evidence that this production has mass appeal. Spielberg and Jackson have taken Tin Tin and made him accessible; the visual chances they’ve taken here have paid off, for the most part, though I’m not convinced that the 3D was a necessary addition. The running time at 107 minutes feels a little long for an animation but again the audience didn’t seem to grow restless at any time. For me this won’t match the blockbusters of the year, nor will it stand up as an option for solely adult audiences unless they are Tin Tin fans to begin with. But is certainly an enjoyable way to spend a couple of hours with family.